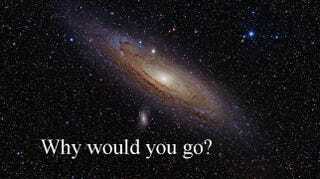 How would you convince the 20th generation of space colonists to leave Earth? It is the year 2251. All is well on Earth – food is plentiful, climate ills are cured, and war is nonexistent. Humanity left its home decades ago, with the United Nations of Earth currently on the 20th round of colonization. How would you go about convincing a new round of colonists to brave the hazards of space? Imagine a future where space colonization is passé. No overtones of adventure, just a relatively safe way to inhabit foreign and often dull, lands — but colonization is the primary concern of the nations of Earth due to mining and other economic trade benefiting life on our home planet. When space travel and colonization lose their luster, how do you gather people willing to give up connections to family and friends and flee the world they grew up on? Will we look to old colonization methods like forced labor and promises of expanded personal freedom? Let's look at a couple of ideas, and ask — why would you go? The top image is of our nearest galactic relative, the Andromeda Galaxy, and from Adam Evans/Flickr. At some point, space travel will no longer captivate the human mind. Money and power always appear to — why wouldn't they work in this case? I'm not sure that cash will lead many to leave the clutches of their home world. It likely would work for members of a destitute population, but not for all. Wealth and subsidies for the benefit of those family members who remain on Earth are a more compelling use of money — but one that still holds self sacrifice and family at its core. To steal a line from Milton's Paradise Lost , "Better to reign in hell than serve in Heaven." Governors and leaders should be easy to obtain: Put a nice title and honorarium on a position, and people often clamor for it, no matter the duties. Gathering workers, however, will no doubt be the hard part. Prisoners, in most countries, lose a large amount of personal freedoms once incarcerated. Prison labor is a force oft used in the course of history — prisoners built roads throughout the United States in the 1800s, Chinese prisoners are used for the financial benefit of the state (including online gold farming using World of Warcraft), and the Australian colony of New South Wales began as a British penal colony. That last use of prison labor is the most applicable — history shows nations to be more than willing to use prisoners to advance land holdings. Why would space be any different? If I found myself in prison in 2251, I would jump at the chance to exchange a long prison sentence for freedom and a fresh start on a distant planet. Similar to the prisoner's dilemma above — is it better to live out your quiet years days on a planet you know well or take a chance and live a new amongst the stars? The premise of John Scalzi's Old Man's War centers on the elderly saying goodbye to the Earth and their loved ones, and joining a mysterious defense force at the age of 75. Enlistees are promised a new life as a colonizer at the end of their tour of duty (if they survive), and receive new, enhanced bodies in the process. If we are colonizing the galaxy, then life extension and enhancement would likely be technologies at humanity's disposal. Would individuals be swayed to colonize simply by the extension or enhancement of life in the lingering face of a feeble death by natural causes? Quite possibly – time may be the only currency of import to many individuals. When overpopulation becomes not only a resources problem but a problem of physical space constraints, many countries could turn to the method of the People's Republic of China and limit the number of offspring an individual can bear. Would the option to create a large family convince individuals to leave Earth and colonize? This path would appeal to emotions and innate instinct, probably more so than any of the previous possibilities. The ability to start a large family amidst the unknown would be interesting, but at the same time brings along a (suspected) decreased life expectancy in a land separated from the stream. Also, would it be difficult to convince family oriented individuals to leave behind their current families on Earth to start a larger (and later) generation? This consideration could be exploited, calling upon several generations of a family to embark on colonization attempts. The prospect of religious freedom drew English Puritans across the dreadful Atlantic to what is now the United States. Pockets of religious groups, with or without government affiliation, would make for interesting colonists. These groups would likely have sufficient backing from affiliate religious groups on Earth as well, since many religious organizations would likely see this deed as a missionary act as well. The opportunity for increased social freedoms is most compelling. Should trans-human or post-human groups receive the cold shoulder from societies on Earth, I have no doubt that they would welcome a home in the stars. Colonization is an easy step for either crowd, groups that already made extraordinary leaps in modifying or separating themselves from human bodies. Family, religion, and freedom - the same reasons many moved to unknown territories in the past 500 years will likely be the same ones that compel people and families to set off for colonies in the stars once the feeling of adventure is gone. What possibilities would cause the 23rd Century version of yourself to join a colony if the Earth is in good health and space colonization is a bit mundane?